How can you support the Rebecca Schofield All World Super Play Park? 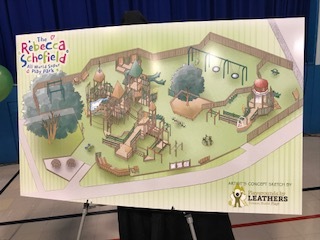 The Frank L Bowser School is hoping to raise 650k towards an amazing new play park now named after alumni Rebecca Schofield! The park will be the most inclusive park in the maritimes and built for accessibility for most everyone. Over the next month there are many ways you can help support the park too! Parent Prom brought to you by Prom Pretty and Cocoa Room is Oct 13th with 25% of sales to the Park. Parent Prom is for everyone with a great night to dance the night away and bid on awesome silent auction items too! Hello Fall! Bazaar Oct 14th 12-4pm at 145a Lakeside Drive Riverview is a craft show with over 30 vendors so far to #ShopLocal and #SupportLocal too. Door donations will be collected here and given to the park!